VIA is very excited about their new PT880 chipset for the Pentium 4 processor, in fact they're so excited they even had a representative come the PCstats office to meet with us, and explain the in's and out's of the new VIA chipset. Quietly they told us that the PT880 can hold its own against the i875P in terms of performance, yet will be less expensive than the i865PE chipset, meaning boards based on the PT880 should more affordable without sacrificing performance. That's a very compelling combination, but will VIA be able to live up to its own expectations? Historically VIA has never had a problem undercutting Intel when it came to core logic pricing, though the company has had a hard time consistently matching the level of speed and stability that Intel chipsets are know for. That's not very surprising though given that the Taiwanese chipset manufacturer is not as large as the boys in Santa Clara. Remember though this is the computer industry. Revolutions happen all the time, and this is a place where a company's fortune can change within just one product cycle. VIA's memory controllers have been revamped for the PT880, and now implement a technology called DualStream64. As with many modern memory controllers, DualStream64 is capable of running two 64 bit DDR DIMM's in parallel. This action doubles the bandwidth available to the processor, and that means even the bandwidth-hungry 800 MHz FSB Pentium 4 is satisfied. Other differences between the PT880 and high end i875P chipset worth noting revolve around the amount of memory the board can support. With the PT880 supporting any Northwood Pentium 4 processor, it can also tackle as much as 8GB of ECC/non-ECC memory! Intel's i875P settles for half that much. 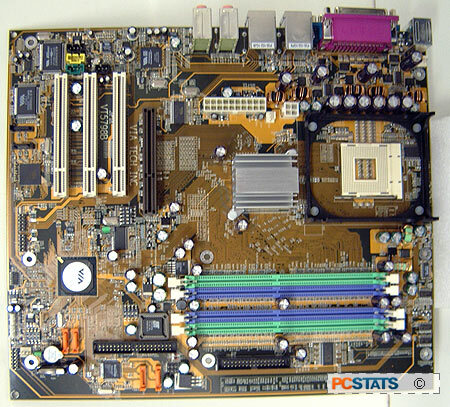 The VIA PT880 reference board PCStats had a chance to test out is a little different from what you will see when PT880-equipped motherboards hit the retail channels. The VIA PT880 chipset is paired up with the VIA VT8237 Southbridge which itself has all the usual goodies (native Serial ATA/RAID support, eight USB 2.0ports, etc). Because of all the high speed devices on the market right now, VIA has doubled the V-Link bandwidth from 533 MB/s to a full 1 GB/s. This should help alleviate any potential bottlenecks between the Northbridge and Southbridge.